At the end of February my husband and I moved into our new home. 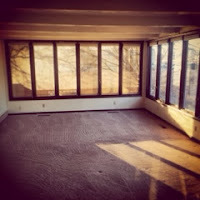 We went from a dark apartment covered in 1970s shag carpet (complete with carpet in the bathroom and kitchen) to a duplex with a finished basement, and extra bathroom, and a kitchen with wood floors. 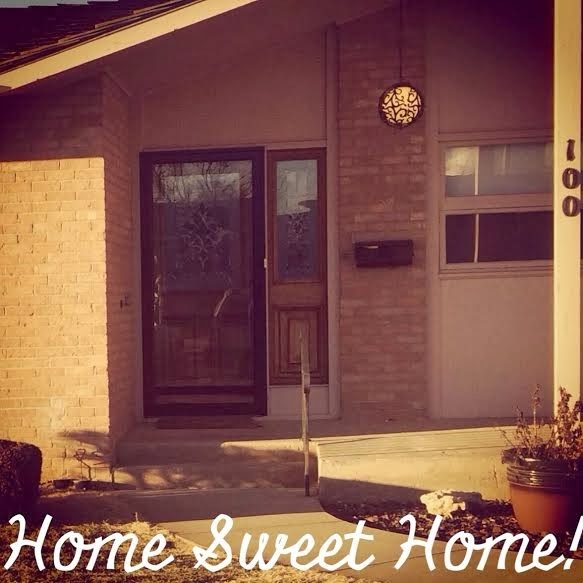 We’re still renting, but this definitely feels like home sweet home! My favorite room in this apartment is the family room because it has so much natural light… 11 windows and a large glass door to the backyard. From the moment we walk through the front door it feels like light just bursts inside. There’s even a skylight in the kitchen. Light is everywhere and it makes the place feel a lot more like home. I didn’t realize how dark our old apartment was until we moved. 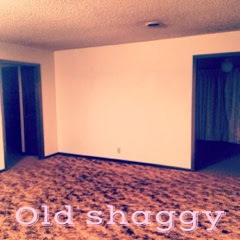 And now that we have a space with lots of natural light, I can’t imagine living in dark “Old Shaggy” ever again. There are lots of benefits of letting natural light in. Not only will it keep our energy bills down (hopefully!) but it also feels better. Light is warm. It is comforting. It can put us in a better mood and can even help us appreciate our surroundings. Light feels like home. I don’t know if I’d call “Old Shaggy” the land of gloom… but there’s dramatic difference from where we were to where we are now. Being in an environment filled with light makes us realize just how dark our last home was, and it makes us more grateful for what we have. I think the same thing happens to us spiritually. Sin loves darkness. Sometimes we don’t realize just how dark the darkness within us is until we’ve allowed the Light of Christ to break through. In my own life I can recall moments where darkness had been the norm. And then at some point, maybe when I least expected it, Christ’s love and mercy broke through and the Light that entered into my life brought joy and rejoicing. With God’s grace I was able to recognize the darkness that had once existed for what it really was. Of course, I am human so I continue to make mistakes and fail… but that’s where the beauty of the Sacraments, especially Confession and the Eucharist remind me to renew that joy of being in the Light of Christ. As we step into the Lenten season and think about what we’re “giving up” or “doing extra” over the next six weeks, maybe the first thing we need to do is ask how does Christ want to Let the Light into my soul? What’s keeping me from allowing that Light into my life? And once I’ve allowed Christ’s light to pierce the darkness, what happens next? How will that light make a difference in my personal encounter with the Lord? I’ve said before that Lent is not my favorite and yet I realize that this is the time of year where the Holy Spirit really does a number on my heart if I’m open to it. It’s a time of recognizing my weaknesses, but also allowing Christ to transform those things into strengths. I feel like this year in particular Christ is asking me to let the Light in, so He can make me who I am called to be. If I can open up my heart even just a tiny bit more, I think I can come to realize just how much I need Christ in my life and how much I want Him to be there. When the Light of Christ bursts into our hearts, we realize that it is beautiful. It is welcoming and it is merciful. It is where our hearts are at home. Pierce the darkness, and lead me to you. Amen.